The CyberScan CON 1500 provides microprocessor precision in a compact bench top design that is easy to use. This meter allows you to measure Conductivity, Resistivity and Total Dissolved Solids (TDS). Select cell constants, temperature coefficients, normalised temperature, TDS factor and temperature units. Replatinise your conductivity probe It all adds up to rapid, completely automatic, intuitive operation. High-end conductivity measurement in the laboratory is simple with Eutech’s CyberScan CON 1500. 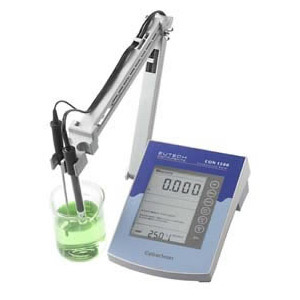 Featuring auto-standardisation, auto-calibration and auto-ranging capabilities, the bench meter accepts 2-cell and 4-cell electrodes, giving you a broad range of measurement at ±0.5 % full scale accuracy. Meter comes with bi-directional RS232 capabilities for two-way communication with computer or printer, and a complimentary Data Acquisition Software (DAS) that allows you to work on meter remotely via your computer.